I had always thought of KeepScore as a fairly simple app. Functional, yes. But beautiful? Meh. It’s a counting app. Counting apps only have to do one thing right, and that’s count. This is not brain surgery, people. Just keep it simple, and you’re already 95% of the way there. A few weeks ago, though, I decided to make KeepScore my guinea pig for trying out some new design elements from the “Holo” theme, introduced in Android 3.0. At the same time, I also added some fit-and-finish features that were sorely needed, giving the app a much more coherent feel. 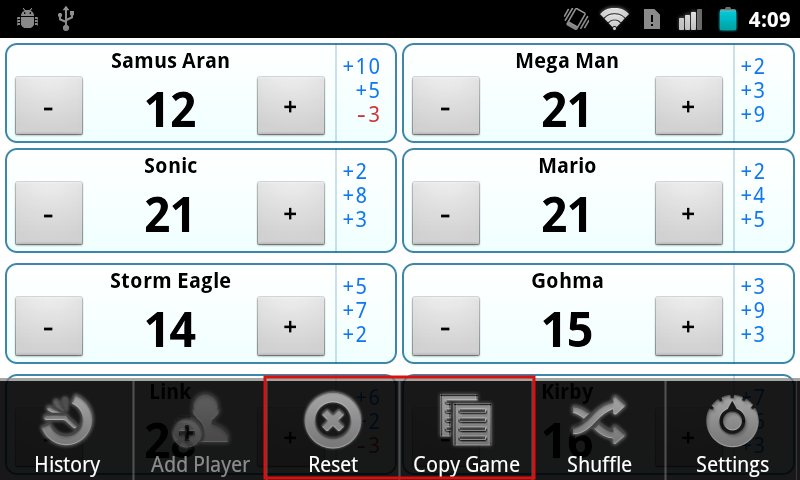 The result is KeepScore version 1.2, probably the biggest update I’ve ever written for the app. 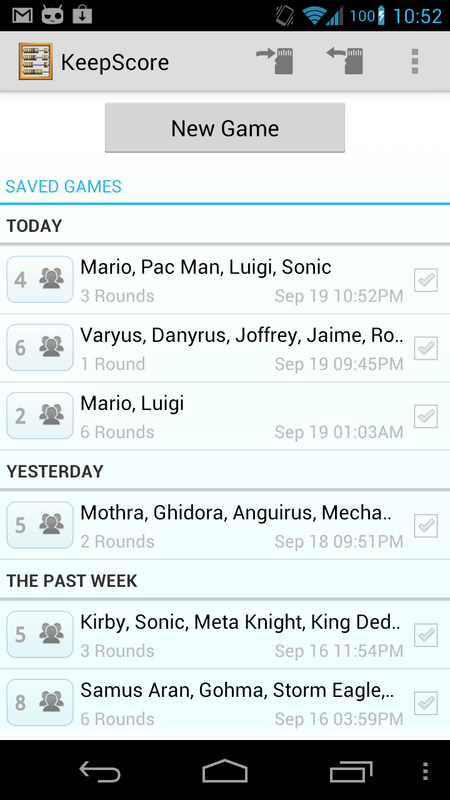 It looks and functions so differently now, I feel like I barely recognize my own app. What I like most about this update, though, is that it adds a fresh coat of paint without subtracting anything from the usability. In fact, I think KeepScore is actually much easier to use than it was before, to the point where I feel a little embarrassed for having bragged about it in previous posts. The new design basically takes the “Load Game” screen and transplants it onto the welcome screen. I find it’s a huge improvement. 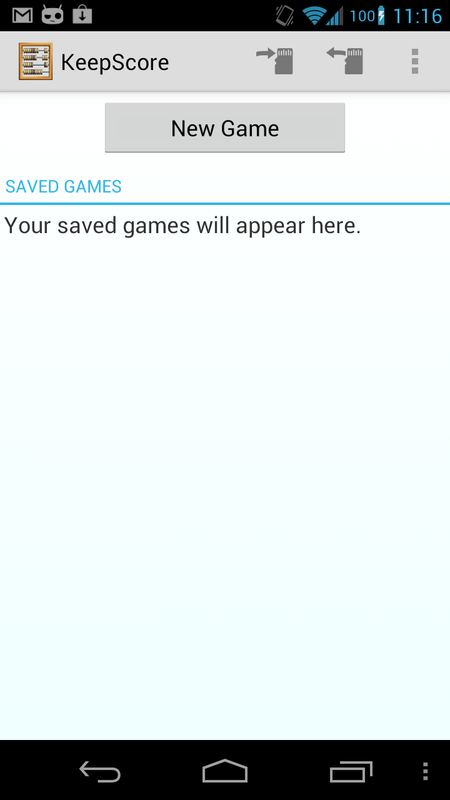 There was a ton of wasted space with the old design, and plus it took two clicks to get to your saved games. Now everything the user needs is front and center, without sacrificing any usability or app branding. I also wanted to make sure that the new design wasn’t so cluttered that it would confuse first-time users. Their experience is still pretty streamlined: there’s a big “New Game” button the size of a barn that you can’t possibly miss. Big gray squares. Your thumb is drawn to them. The new home screen also makes use of the “Action Bar” paradigm, which was introduced in Android 3.0 and back-ported thanks to the wonderful Action Bar Sherlock library. Never change, KeepScore. Never change. Did ya miss it? The last score in the score history now has a “fade-out” gradient, to indicate that the list has been cut off at the bottom. This is to solve a common problem I heard from users, which is that they could never remember whether the list was ordered top-down or bottom-up. Hell, I kept forgetting myself! So hopefully this subtle change will make that clearer. This is something I struggled with for a long time. 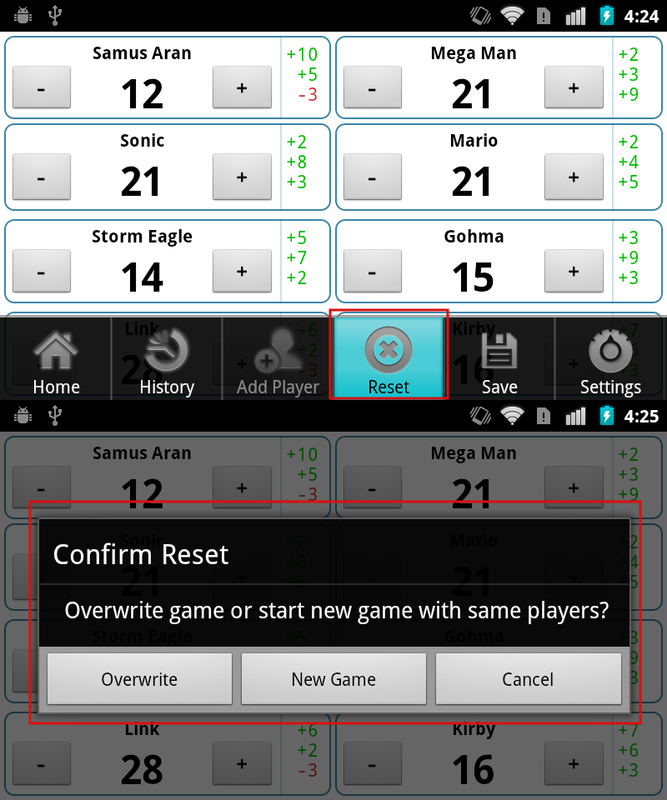 In early versions of KeepScore, I had a “Reset” button, which prompted the user with “Overwrite game or start new game with same players?” Knowing that users don’t read anything, though, I was unsatisfied with this dialog. “Reset” and “Copy Game” buttons. 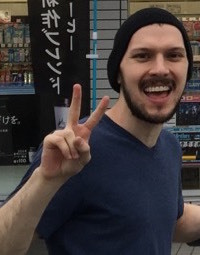 What I realized about “Reset” and “Copy Game” is that they’re an inelegant solution to a common problem. 99% of the time, if you’re still using the app after the game is over, it’s because you want to start a new game with the same players. However, I didn’t want users to overwrite their old scores, because then they’d lose all their history from the previous game. Hence the option of copying the game before resetting it. “Rematch” captures this concept much more succinctly than “Copy Game” and “Reset.” And plus, it makes it more difficult for users to shoot themselves in the foot, i.e. by overwriting their scores. Unfortunately I can’t take the credit for this idea. I borrowed it from Rounds, which is a pretty slick round-based score keeper that was actually originally built on KeepScore’s source code. 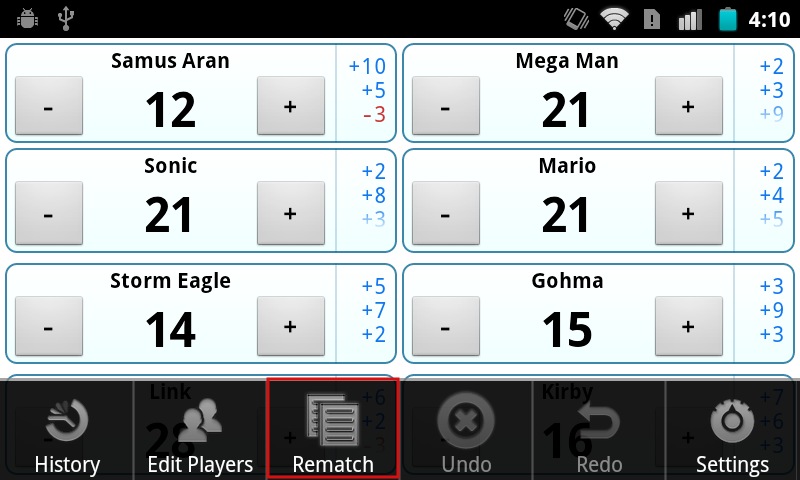 When I saw the “Rematch” button in that app, I slapped myself on the forehead and wondered how I’d never thought of it. This is a pretty nifty new feature. In the previous versions, I had an “Add Player” button and a “Shuffle” button, but there was no way to manually reorder players or delete players. Every day I’m shuffling, and adding, players. Now all of that is handled in a separate “Edit Players” screen, which makes it a breeze to change players mid-game. You can even touch and drag to get the order exactly right. 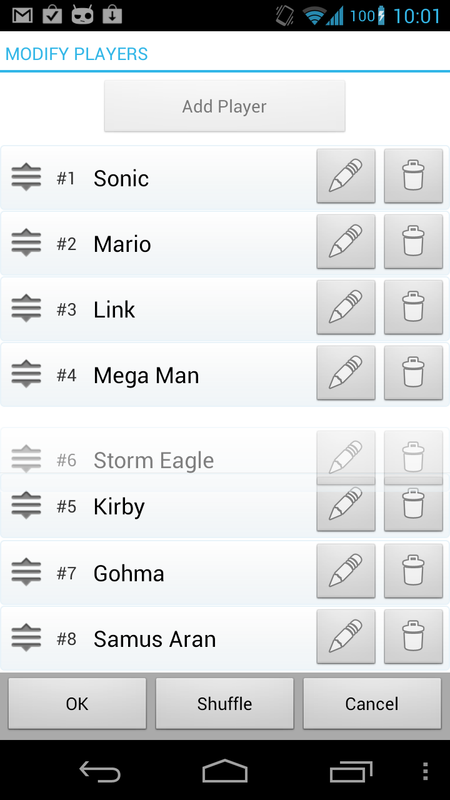 Clearly, Storm Eagle should go after Mega Man. This screen also makes it easier to change players’ names. Previously, the only way to do that was to long-press on a player’s name, which is kind of low on discoverability. But hopefully the button with the pencil icon is a lot easier to figure out. A tip of my hat goes to Carl Bauer for the drag-and-drop list implementation. Fact: nerds love data. And gamers are all nerds. 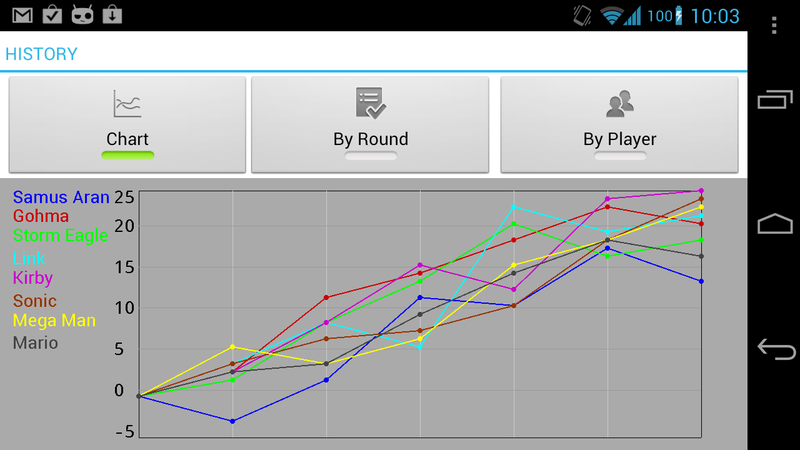 Players’ scores are on the Y axis, rounds on the X axis. It’s probably useless for any non-round-based game, but kind of neat nonetheless. I realize the history chart is probably the most unpolished out of the new visual features I added. The colors are pretty bland, and it’s all very MS Paint-esque, because Android has no native graphing library, so I had to whip this up from scratch. But I’m not too concerned, since most people don’t bother going into the History anyway. And for those that do, I think it’s a nice little feature. Backup/restore. Back up your games to an XML file on USB storage, and load them later. Duplicates are handled automatically based on unique game IDs. Undo/redo. Self-explanatory. Any action in-game can be undone or redone, i.e. scores subtracted, scores added, etc. Better German translations. Germany is the Mecca of modern-day board gaming, so this has got to be worth something. The app is already available in French and Japanese. Dropped support for pre-Eclair devices. Android 1.5 and 1.6 only account for 0.5% of the user base, and the new backup/restore feature required some XML libraries from Eclair. Sorry, Cupcake and Donut! You were delicious while you lasted. So there you have it. 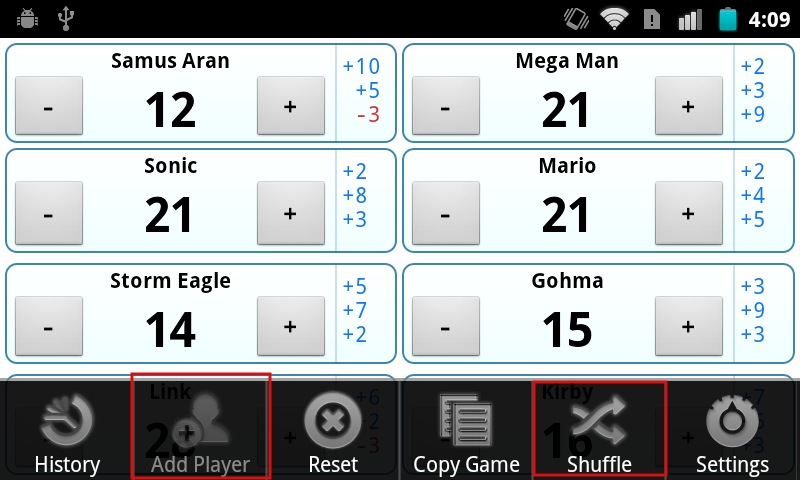 KeepScore v1.2 has a fresh new look, a better UI, and it’s still free and open-source. So go grab it from the Google Play Store! 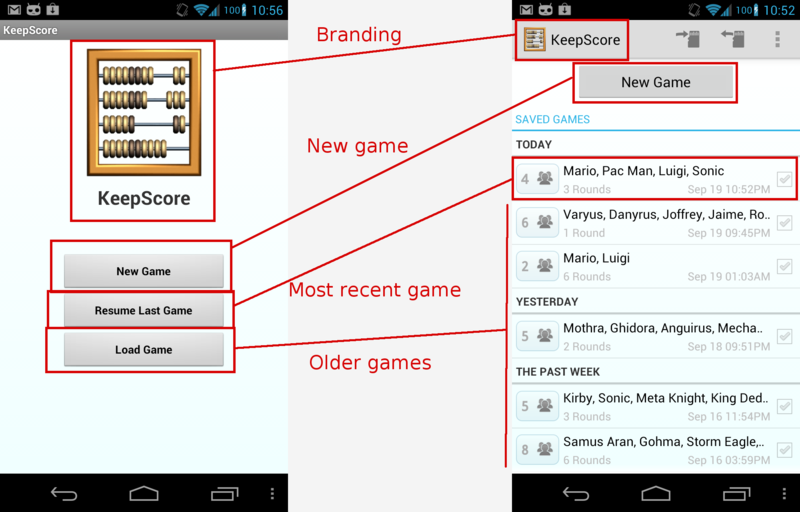 Recently I went to the trouble of de-uglifying the “Load Games” screen for KeepScore. The whole screen is just one big ListView, so taking a cue from my own recent post, I added some fast scroll sections divided by date. I think the effect is more pleasing to the eye, and it also makes it easier to navigate through your past games. There. Isn’t that much nicer? The important information (i.e. the player names) pops right out, whereas the other stuff is banished to a light gray subtitle. The icons to the left give the user the feeling that each row refers to some tangible object, saved somewhere, and the checkmarks on the right are useful for doing bulk-delete operations. I’m especially proud of the little row of buttons there at the bottom. They pop up when any boxes are checked, and gracefully recede when the boxes are unchecked, similar to the Gmail app. It was really tough to get them to actually hover over the ListView as they animate upwards, and then have the ListView concede screen space once the animation is complete. I report with some satisfaction that even the Gmail app (version 2.3.5.2) doesn’t do this – when the animation starts, the ListView jumps upward, leaving an awkward little white space for the buttons to pop over. Overall, the new UI is cleaner, prettier, and more usable. And the code is open source for anyone who wants to borrow it. If there’s one piece of the core Android framework that every Android dev struggles with, it’s ListView. ListView is incredibly flexible and complex, and you’ll probably find you need it more than once in any decent-sized app. If you haven’t already slammed your keyboard and screamed at ListView before, you probably haven’t been writing Android apps very long. It’s so important, Google even had a whole session about it at their I/O conference in 2010. ListView is the crucible, the teeth-cutting, the rite of passage for all aspiring Androidians. It’s like Luke seeing Darth Vader in the cave on Dagobah. Once you’ve battled with ListView and emerged from the cave victorious, you’ll know you’re a true Android developer. This is just one story about ListView. When I was writing Pokédroid, I came across an interesting problem. The first screen of the app was just a huge list of creatures, but it was too difficult to navigate through. Depending on what game you had, you were only interested in the ones numbered 1-151 (first generation), 152-251 (second gen), 252-386 (third gen), 387-493 (fourth gen), or 494-649 (fifth gen). This meant that the newer (and therefore more interesting) Pokémon were at the bottom, where they were hard to get at. But assuming the National Pokédex numbering, this was just the proper order. Problem: there were too many goddamn Pokémon. The solution I came up with was to make the list more navigable by showing “fast scroll” overlays with the names of the various Pokémon generations. Named after the games’ regions, they go “Kanto,” “Johto,” “Hoenn,” etc. That way, the user could immediately know what section of the list they were in, and they could quickly scroll between sections. This is made possible by the use of the “fast scroll thumb,” i.e the little grooved square to the right. It allows you to zoom through your list contents and hone in on the item you want. It’s like blasting down the highway and watching the exit signs, versus crawling down a suburban street, inspecting each house number one-by-one. It’s a much better user experience. Yup, the overlay has a fixed width, so you can only really use it for single characters. What’s a poor Android developer to do? As it turns out, the only way to fix this problem is to implement your own version of the Contacts app’s internal FastScrollView and hack it yourself. I wasn’t the first to discover this, but I did post some snippets of the solution to Stack Overflow back when I first implemented it in Pokédroid. Since then, I’ve been getting some questions and clarification requests on the original post, so I decided to go ahead and write a full demo app to show how it works. After all, Pokédroid is and will probably always remain closed-source, but this code at least is probably worth sharing. That’s Pokémon sorted by generation, type, and base HP. The possibilities are pretty endless. You can take your ListView and sort it, divide it, slice-n-dice it however you want. The important thing is that “fast scroll” sections make for a better user experience. ListViews can hold a lot of data, but that doesn’t mean you should let your list get bloated and then leave all the hard scrolling up to the user. I have an app on my phone where the developer uses an unsectioned ListView with over 200 items. Two hundred! It takes almost five seconds just to scroll from top to bottom! That may not sound like much, but in the UI world, five seconds is an eternity. Just imagine your poor users, holding their phone in one hand and flipping your ListView with the other hand, over and over again, like they’re trying to light a wet match. Then reflect on how much you could improve that experience with some fast scroll sections. Well, ListView-abusing Android developers (you know who you are): now you have no excuse. The CustomFastScrollView code is public and open-source, so go use it. Get cracking! I recently open-sourced two of my Android apps – App Tracker and Chord Reader. You can find the code on GitHub. I open-sourced them for very different reasons, although the catalyzing events were similar. In both cases, I had a request from a fellow dev for more information about the app, which made me question why I was keeping it closed-source in the first place. And in both cases, I couldn’t find a good reason to keep the code private. But in a broader sense, the two apps mean very different things to me. App Tracker was a project that I poured a lot of effort into, but which turned into an unmitigated failure, with only 294 active users (and less than 4,000 downloads) after almost two years on the Android Market. It’s kind of embarrassing to admit now, but at the time I was writing it, I actually thought App Tracker would be my ticket into doing freelance app development as a full-time gig – hence the laughable premium version. Ultimately, though, the app suffered from bad design and bad marketing (can you guess what it does from the name and icon? ), and it never really took off. So in this case, opening up the source means acknowledging my failure and cutting my losses. It’s a humbling moment. Chord Reader, on the other hand, was an app that I barely put any effort into, and against my expectations became pretty successful, with over 35,000 downloads (and 10,000 active users) after about a year. It’s even made me a modest amount of money from the AdMob campaign (about $100), although I put in the ads more out of curiosity than anything. I never really found the time or interest to keep maintaining this app, though, so it ended up becoming something of a neglected stepchild to me. There were lots of requests for new features (autoscroll, set lists, bluetooth integration), but for some reason I just couldn’t muster up the enthusiasm to implement them. So in this case, opening up the source means releasing my app to the community, where hopefully it will find more dedicated contributors. It also means getting rid of the ads (since there’s no point in having ads in an open-source app), which I’m actually relieved to do, because they weren’t making me enough money to justify uglifying up the UI. 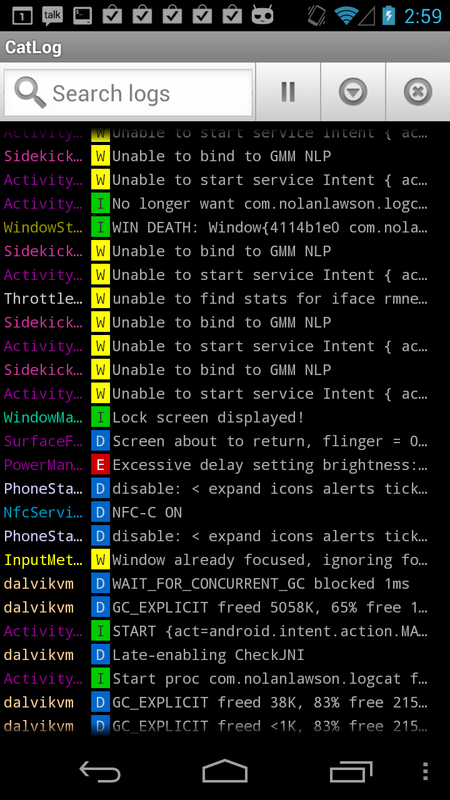 App Tracker reads the system logs (“logcat”) in a background Service and notes when other apps are being launched, which allows it to keep usage statistics. It should be interesting for anyone looking to write an app to detect when a third-party app has been started (which was the question from a fellow dev that prompted me to open-source it). For instance, all of the various “protect my apps with a password” security apps use this technique. Be forewarned, though: these methods are faulty, given that the Android OS treats with suspicion any Service that tries to run 24/7, and may kill your Service without warning. Chord Reader reads chord charts downloaded from sites like AZChords.com and UltimateGuitar.com, parses the text, and displays information about the chords, including various guitar fingerings. The most interesting part is the system of regexes (really, a grammar) to parse the chords and determine, for instance, that “Abmaj7” and “G#M7” both mean the same thing: “A-flat, major quality, 7th added.” A good place to see this in action is the unit tests. Music geeks should get a kick out of it. And of course, anyone who just wants to contribute to the project (like the dev who first contacted me and suggested open-sourcing it) is welcome to create branches and pull requests on GitHub. Oh, and in case I haven’t made it clear elsewhere, when I open-source something on GitHub, please assume that the license is the WTFPL license, or some other very permissive open-source license. I honestly don’t care what you do with the code, although hopefully you’ll be nice about it and give me credit. Happy coding! Puzzling over cryptic bug reports is a frustrating and unavoidable part of being a developer. When users want to complain to you about a bug, they just usually don’t think through all the pieces of data that might help solve the problem. What OS are you using? What version of the software? What were you doing to cause the bug? When users are angry, they don’t want to deal with such tedious details. They just want to vent. This happens with large software companies, small software companies, and indie developers alike. It’s such a common gripe among developers that it’s not even worth describing any further. Any seasoned dev knows what I’m talking about. In the Android world, dealing with bug reports is even more frustrating, because they usually come in the form of 1-star reviews on the Android Market. 1-star reviews provide all the cathartic venting that users desire, without any of the useful information that could actually solve the problem. always forced close on samsung galaxy s. I have to uninstall it. Yeah, not so helpful. Figuring out a bug from comments like these is like trying to solve a detective story with half the pages torn out. 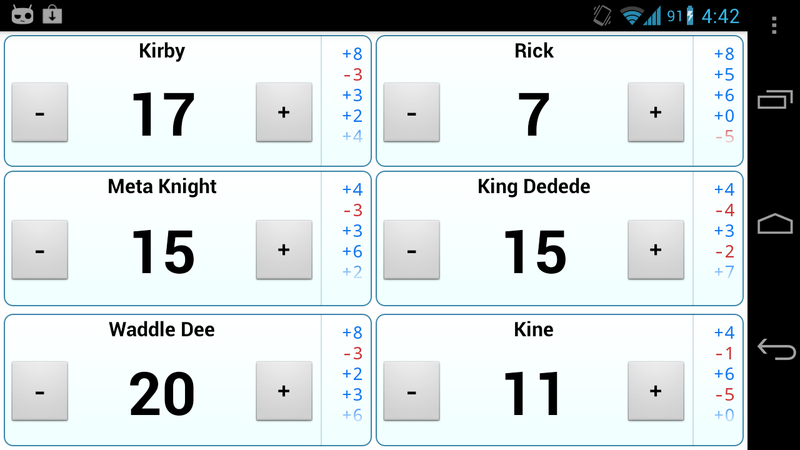 KeepScore is designed to save scores automatically. In particular, it’s supposed to automatically save your scores whenever the app leaves the foreground, as shown here in the source code. I couldn’t reproduce the data loss described in these reviews. Even when an incoming call disrupts an ongoing game, KeepScore gracefully exits and displays a comforting message saying, “Game automatically saved.” I’ve never seen it lose data. So what happened here? Did the Android system kill the app before it could call the onPause() method and save the data (which, according to the Android Activity Lifecycle, shouldn’t happen)? Did the users just accidentally create a new game, so that it replaced the old one in the “Resume Last Game” section, making them think that the data had been lost? Who knows. Without a proper bug report, I have no idea what to make of this. Bad reviews make the author feel better, but they rarely lead to better applications. I’m going to try not to let these reviews sour my experience with KeepScore, though, or discourage me from putting more effort into it. I want to get to the root of this problem. So, loyal KeepScore users, have any of you run into this particular issue? If so, please report it on the GitHub page, and let’s squash this bug! Oh, and if I do manage to fix it, please leave a nice little comment for my trouble, will ya? It’d be nice to have some good reviews to offset all these bug reports.